I'm sure many of you have been waiting for this one. Not only is Plants vs. Zombies from PopCap available today... it is also the Amazon AppStore's freebie of the day. However, you can only download it via WiFi (legal reasons based on other contractual obligations?). I'm an emulator nut as I love retro gaming and while I've decided to refrain from reviewing emulators they are high on the list of reasons why I went Android over iPhone... so this is important news to me. As per the above Engadget link (click on thist post's title), which I came across solely by chance today, Google has suspended emulator maker yongzh's account and removed all of his emulators from the Android market. In a nutshell, as the Android platform grows companys like Sega and Nintendo are taking more notice to the "wild west" nature of the Android market and the massive amount of copyright violations that go on there. However, in an odd response, Google has pulled all of one developer's apps leaving not only many of these other "roms" available, but also countless other emulators including competing ones. This response by Google makes little sense and leaves me wondering if there's more to it. However, all of these emulators are available at slideme.org (another source for Android apps) including the recently removed Nintendo 64 one which can be downloaded here: http://slideme.org/application/n64oid. I've downloaded it and it's quite stunning. The article would have me believe that these are full versions of the emulators, but I see there's a link in the program to get the full version from the Android market so I suspect these are the demos (where the main difference is the inability to save your game state). ANNISTON, Ala./May 25, 2011 --- Today, the Envizions Computer Entertainment Corporation announced that its new Android-based game console EVO 2 will be available this fall in the U.S. with goals of an international release with availability in certain locations of Europe. EVO 2 earlier adopters can pre-order the system at http://store.envizionsinc.com from the Envizions online store. EVO 2 is the first Android gaming console that will offer users real time gaming playlist and social friend connections. Gamers will also have the opportunity to earn points to purchase premium Android games free with EVO tokens. The system will ship equipped with game cloud storage and Envizions new Qquip SMS blogging reward service. To ensure that the EVO 2 system surpasses expectations, Envizions plans to add motion 3D sensor capabilities toward the end of fourth quarter in 2011 and developers can start testing the software via website download in two weeks. EVO 2 will incorporate the core software components of Envizions’ beta EVO Smart Console released in 2009. 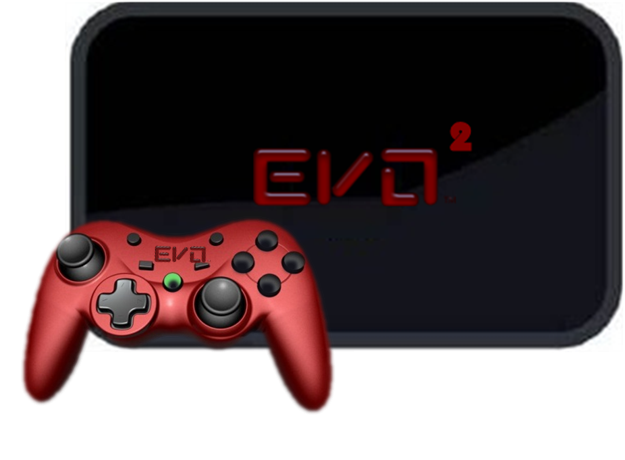 EVO 2 is an open console and gamers can modify any part of the system. New updates and upgrades will be released periodically after the system launch. Android developers can get the free EVO hardware SDK today from the Envizions store with a required annual $149 software support fee per unit. Developer fees and royalties are waived for the first 1000 developers. “Game development for EVO 2 is cheaper for developers so they have the opportunity to create games on a platform that will increase their return on investment. Developers can also submit pre-existing Android games”, stated Derrick Samuels the CEO and Founder of Envizions. And last, the EVO 2 is the first crowd source and social participation console. Envizions will let customers participate in the design roadmap of the console by means of Twitter, FaceBook and the new EVO 2 website. The community can vote on the system’s first launch location and the appearance of the console in terms of color, package design, and product image. My Android tablet finally arrived today (an Asus Eee Pad Transformer). The packaging was mighty similar to the iPad 2 with a nice cellophane wrapper around the phone. Unlike the iPad it actually had some instructions and an "assembly required" plug for charging which I presume is to make it easier to 'internationalize'. I always plan to charge these as soon as they arrive so that I'm not disappointed when I actually want to break it out and use it later. When I finally got to setting it up, it was pretty nifty how I could connect to Google via my WiFi connection and get all synced up WITHOUT having to plug it into a PC with iTunes or some such nonsense. I am, however, a bit disappointed with the fact that devs apparently have to code for a tablet. I was kind of expecting apps to be scaled like on the iPad if they weren't written for the tablet form factor (or at least occupy 2/3rds of the screen given the resolution difference between my phone and the tablet). Some apps have apparently been appropriately coded, and others have not and show up in a tiny box that isn't even centered on the screen. That said, Paper War for 2 Players is GREAT for a tablet as I figured it would be. It's hard for me to say whether I like or love it at this point, but at the very least I can do a better job of game testing for those reading this site. As for Sony's announcement that Minecraft will be an Xperia Play exlcusive... I'm not sure that's a story that should even be given the time of day by the various Android sites that are out there. Anything exclusive to the Xperia Play is NOT Android in my book. But I suppose, with that logic, you could argue all of the Tegra 2 games aren't either... fragmentation stinks. Entertainment announced today a brand new iOS and browser-based game based on the popular anime series "Fullmetal Alchemist: Brotherhood." The turn-based RPG fighting game, called Fullmetal Battle, will launch this summer on iPhone, iPad, Android and browsers (Facebook). "FUNimation and Good Game Productions teamed up to bring fans the opportunity to battle in the rich Fullmetal Alchemist universe. As both fans and longtime followers of the show, we hope to appeal to our loyal fans and to expose new fans to this show which continues to resonate with so many people," said FUNimation president and CEO Gen Fukunaga. Fullmetal Battle is a fast-paced, turn based group RPG that will capture longtime fans of the series and newcomers alike. Players will design their own state licensed alchemists and choose from a vast array of abilities and effects inspired by the "Fullmetal Alchemist: Brotherhood" series to arm themselves for battle. 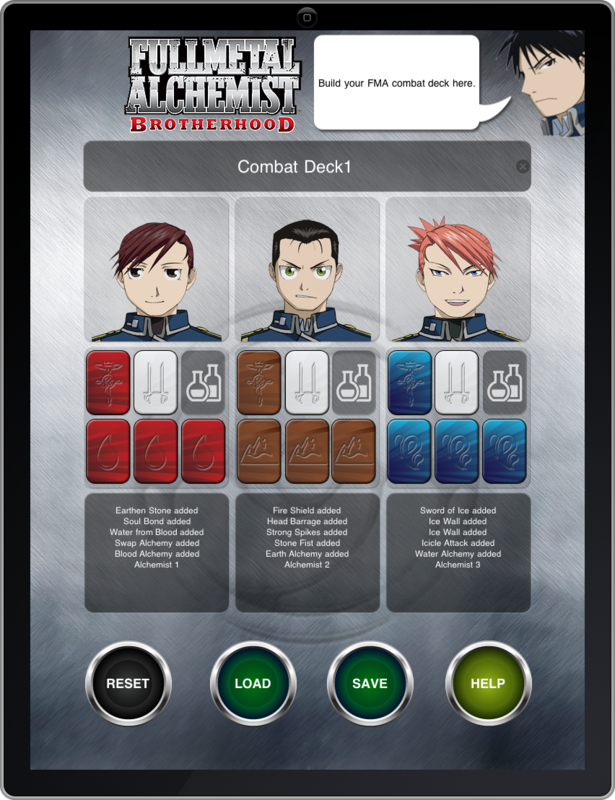 Players can challenge popular Full Metal Alchemist characters-including favorites Alphonse and Edward Elric---while receiving helpful tips and advice from Roy Mustang. Players band together with fellow alchemists in three vs. three battles, but will level independently through skills and attributes. With unique access to special potions and single-use items, players have the opportunity to upgrade their core Alchemy transmutation circles that are central to the game. In addition, gamers have the option to recruit friends and fight with or against them in action-packed clashes! The anime series is adapted from the manga series written and illustrated by Hiromu Arakawa. The world of Fullmetal Alchemist is styled after the European Industrial Revolution and set in a fictional universe in which alchemy is one of the most advanced scientific techniques known to man. The story follows the brothers Edward and Alphonse Elric, who want to restore their bodies after a disastrous failed attempt to bring their mother back to life through alchemy. To restore what was lost, the brothers scour a war-torn land for the Philosopher's Stone, a fabled relic which grants the ability to perform alchemy in impossible ways. The manga has been a consistent top-seller for years while the anime just ended its highly rated run on the late-night [adultswim] block. "We are huge fans of Fullmetal Alchemist: Brotherhood, so to have this opportunity to work on the game is extremely exciting," said Grantley Day, Founder and CEO of Good Game Productions. 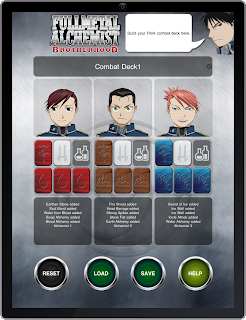 "Fans of trading card and turn-based RPG's will love the fast pace, the extensive customization and the rich storyline of Fullmetal Battle." Founded in 2009 by Grantley Day, Good Game Productions is committed to bringing MMO's into the world of Social Networking. With strategic placement on iPhone and Facebook applications, Good Game Productions brings a potential new audience to each franchise. FUNimationR Entertainment is the leading company for home video sales of Japanese animation in the United States. FUNimation has a proven formula for launching and advancing brands, and manages a full spectrum of rights for most of its brands including broadcasting, licensing, production, internet, and home video sales and distribution. For more information about FUNimation Entertainment and its brands, visit http;//beta.funimation.com. ThinkFun® Inc., a leading creator of addictively fun, mind-sharpening games, announces that it’s latest mobile game, ‘Solitaire Chess by ThinkFun’ is now available on the Android platform. The Solitaire Chess app, which has been a top educational game for iPhone, iPod Touch and iPad since January 2011, was recently awarded the ‘Parents’ Choice Gold Award’ for mobile apps from the nation’s oldest non-profit guide to quality children’s media and toys. Solitaire Chess is simple for beginners to learn and challenging for the most advanced chess masters. The game can be started without any previous knowledge of chess. Solitaire Chess teaches players how traditional chess pieces move as they progress through the levels. ThinkFun’s growing family of mobile apps also includes the highly popular Rush Hour™ game, based on one of the world’s most successful logic puzzles, which has over 1.1 million downloads and counting. Solitaire Chess for Android has been developed to work on all Android versions, from 1.6 to Android 3.0 Honeycomb, with support for the latest Android tablets including the Motorola Xoom, Asus Eee Pad, and Samsung Galaxy Tab 10.1. Solitaire Chess for Android is now available in both a free version, with 40 challenges across 4 levels of difficulty, and a full version with 400 challenges for $1.99. The app is available by searching for ‘Solitaire Chess’ in the Android Market (Edit: Or by clicking on the title of this press release). The Apple version is available in the App Store. ThinkFun’s award winning Solitaire Chess™ board game is currently available from major retailers for $19.99. ThinkFun Inc. is the world's leader in addictively fun games that challenge your mind. Over 25 years ago, ThinkFun was founded with a dream to change the world through play. We continue to expand on that dream every day with games, brainteasers, mobile apps, online games, and global education programs. Visit the ThinkFun website to learn more. ThinkFun, the ThinkFun logo and Solitaire Chess are trademarks or registered trademarks of ThinkFun Inc. All other trademarks are property of their respective owners. Copyright © 2011 ThinkFun, Inc. All rights reserved. Edit: This game looks gorgeous and is getting good reviews in the Market so far and looks like a must have for adventure lovers. We'll try to get a review up soon. “Reedu: The First Explorer” is now available on the Android Marketplace as a paid app ($2.99). 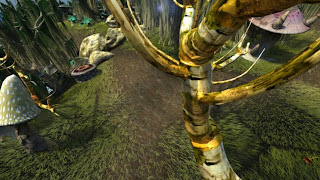 In “Reedu” the gripping plotline and cliffhangers of ‘Lost’ meet the evocative 3D world exploration and mind-bending puzzle solving of ‘Myst.’ There is *nothing* like it on Android. “Reedu” challenges players with 7 unique puzzles – motion tracking, tilt-to-live, logic puzzles and more! 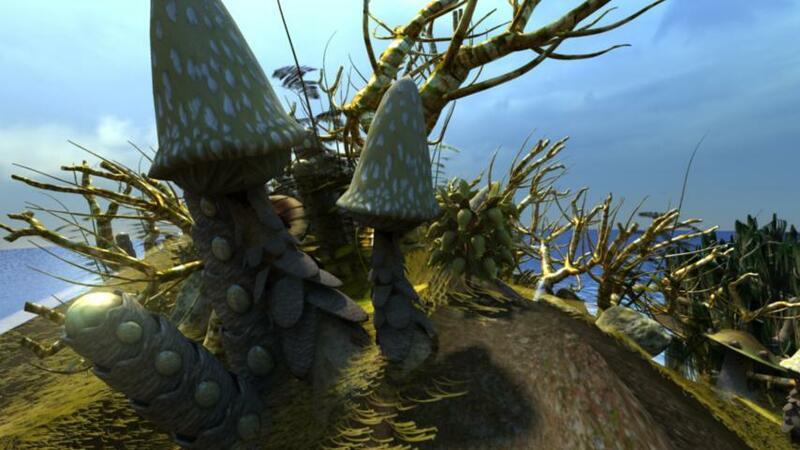 The first episode takes place on the herbivorous world of Veridia, where the vicious vegetation has destroyed any semblance of animal life. 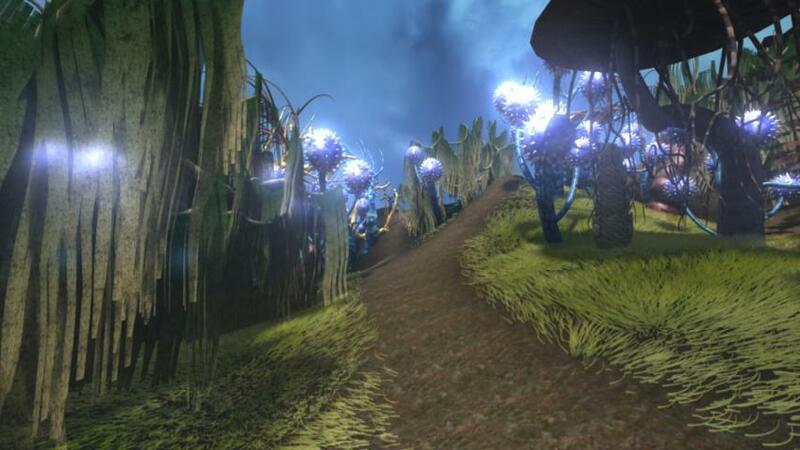 Yet there are clues of a human presence as the player’s wanderings begin to uncover the planet’s mysteries. Episode 1 of “Reedu” is the first in a series of adventure ONLY available on Android. Make your iPhone buddies jealous with the first cool app that WE can have and THEY can’t! Regular updates will be driven by fan input: email storyline theories, puzzle suggestions, or any ideas on what you’d like to see in Episode 2 to fate@nomudagames.com – we will be raffle off FREE copies for Episode 2 for fans that submit! The Square Enix name on a game is pretty much a guarantee of a good role playing experience so I was surprised to see their entry into the sports arena with Big Hit Baseball. Now, do we really need another baseball game? Baseball is one of few sports that is well represented on the Android platform while good Football and Basketball games continue to be absent, but I guess companies have to make what they think will sell (like a good football game wouldn't?). Big Hit Baseball doesn't have any sort of MLB licensing and instead uses 20 generic state and country names such as Illinois and the Dominican Republic for teams. It also offers a good practice mode which is mandatory as this is a baseball game like no other. First, batting is done with quick swipes on the screen and while timing is important so is the direction of the swipe. I really like that they did something different other than the usual positioning of the batter or bat and a button press to swing and the fact that this new control method utilizes the touch screen. Pitching similarly requires you to swipe on the screen. Swipe fast and you'll throw fast... draw a curve with your swipe and you'll throw a curve. For fielding you will also swipe on an outfielder to try and jump or dive to catch the ball although I have yet to see a dive animation. The graphics are nice and the players look pretty sharp and cartoony. Pick a runner off of a base and he'll hang his head as he heads back to the dugout. The sounds of cheers are often heard as is the crushing blow of bat on ball. The controls, however, are where a quality game with some nice, new ideas takes a dive. First, the touch screen controls are less than responsive to the point that I started to wonder if my phone had a problem. Flaky and inconsistent is the best way to describe it. You'll swipe a hit and swipe a hit and then the next three swipes won't do a thing. Even if the touch screen controls worked flawlessly the game doesn't feel much like real baseball. Aside from swiping there's nothing more to fielding so it's all or nothing... either a miraculous catch in which your player appears to leap 30 feet in the air or a failed attempt which the ball sails on by for yet another triple. The pitching game seems muted as well as there's no cat and mouse here and you just want the player to hit it so you can have yet another chance at a fly out to finally end the half inning. Batting, however, is quite enjoyable when swipes work and downright maddening otherwise and being as you just don't know when a swipe will be properly detected I just don't feel like I'm in control. With all of these working against you games become a very high scoring affair... or at least they are for the computer team. I should note that the swiping problem isn't just with the game play, but extends to pressing buttons on option screens as well. I'll press and press again and finally on a third press the game moves on. What options are available? Not too many... you can choose the length of a game (in innings) and how many games in a series. Big Hit Baseball is a game that offers much in the way of potential. I really like the idea of using the touch screen in a gesture oriented way to control the game although I don't think that works well at all for fielding. Unfortunately, in its present incarnation it just feel right and you'd still be better served with one of the other baseball games in the Market. I do look forward to next year's edition of this title where hopefully some of these issues will be cleansed. 2.5/5 stars. Gameloft has finally returned to the Android Market in a small way. Asphalt 6 and Modern Combat 2 are both available for $6.99. It's been 10 days since their press release and I've been waiting to see if their other titles make the jump... and I'm still waiting. Baby steps. Hopefully this will work out well for them as their game quality is generally excellent. Gamevil, one of the premier mobile developers, is having a $0.99 sale in the Android Market. Their games, such as the Baseball Superstars series and the Zenonia series, are among the best of their kind on the Android Market and are EASILY worth $0.99. You might want to just go ahead and grap them ALL at these prices. 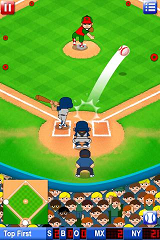 Furthermore, Baseball Superstars 2011 is the Amazon Appstore freebie of the day for Saturday June 21, 2011 so you'll definitely want to grab that if you can. Jane's Hotel is a casual strategy game from Realore Studios, the first game I've played from them. The obvious game comparison is with Diner Dash, as Jane's Hotel has the same kind of rapid-fire realtime gameplay. I wasn't much of a fan of Diner Dash, but does Jane's Hotel do a better job? In Jane's Hotel, you are helping the title character build her hotel from modest beginnings all the way to winning an award for best hotel in the town. In this world, apparently hotel competitions are a big deal. The artwork is bright and cheerful, occasionally crossing the line over to garish. The game is played in a series of stages, with ten stages each in four different levels. You start out with a simple hotel with a few rooms and eventually get to a hotel with seven rooms that you need to scroll around to see completely. In each stage, guests will come into your hotel, and you have to find a room for them and then take care of their needs. You tap on different areas of the screen to pick up coffee, newspapers or what have you and then bring them to your guests. You also have a housekeeper, who needs to accomplish some of the tasks for you. Speed matters, as the faster you fulfill the needs of your guests, the more money you make. Each day, you'll have a cash goal that you need to get to, and if you succeed, you'll be able to purchase new items for your hotel, which raises the complexity by adding more things your guests will ask for. 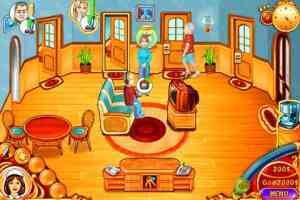 The game does get pretty hectic in later levels, finally culminating at a half-dozen different things that the housekeeper needs to do and about the same for Jane, with as many as seven guests going at once, not all of which are visible at the same time. When guests check out, you have to clean the rooms before they're ready again, and in order to make your goals in the later levels, you have to be quick and turn over the guests quickly. The complexity and chaos actually ramps up pretty well at a decent pace, and I never felt bored with the difficulty level. I also did fail levels occasionally, a relative rarity in this type of game. In the end, I played through the entire campaign game, in bits and pieces. I actually enjoyed it a fair bit more than Diner Dash, which didn't work for me, although it's unclear exactly why. The difficulty curve is part of it, as I felt it was well done. The ability to queue up commands to my characters, as well as the fact I was controlling a couple characters was nice as well. There are some polish problems with the game, or at least the version I played that was provided by the studio. Most of the issues are minor irritants, and none stopped me from playing all the way through, but they're worth mentioning. There are a few functionality problems with the graphics - it's difficult to tell what Jane is holding at times making it hard to finish actions, some of the buttons are hard to press and a few of the target areas on some screens overlap. The game turns the media volume on my phone all the way up when I run it, even if I have the sound turned off, which startled me quite a bit when I would run other apps. The game doesn't always resume properly after locking the handset and on a few occasions caused my Droid to reboot (something I've never seen in another game). Again, none of these were major issues, but they were occasionally frustrating. Overall, I liked Jane's Hotel quite a bit more than I thought I would. I'm not a huge fan of this sort of game, but this one worked well for me, and has been monopolizing a fair bit of my game playing time recently. It will probably be a while before I pull it out again, having played through it all the way, but I could easily see playing through it again at a later time. I'll give it 3.5 stars, and it's highly recommended for folks who are looking for a fairly hectic time-management game. As a game to play in small bites, it works quite well, with the caveat that if you can't quite play through a full level, you'll often end up having to restart the level. Luckily, that wasn't a problem for me, as the levels themselves were enjoyable. This time I wanted to review a game that has been on my device for quite some time. A game that I keep going back to again and again. One that hasn't lost its place on one of my 7 precious Sense UI screens. 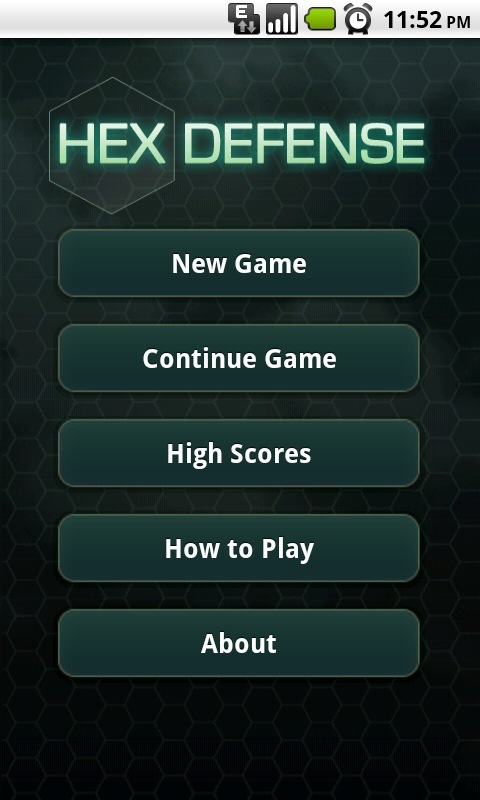 This game, is Hex Defense by the team at gotow.net. Hex Defense is a tower defense game. Now that might stop you right there and make you move on but read on to find out what makes this one so special. I'm a gamer tried and true, however, when it comes to mobile gaming I like to take it in little chunks of time. To me, this means a pick up and go game. One that I can commit an hour to or just 5 minutes if I have a spare few of them. Hex Defense is just that type of game. It has enough depth to keep you interested for hours but is easy enough to get into and out of that you can finish a game in 5 minutes or less if you use the speedup option. So just what is this Tower Defense Genre? If you've been gaming in a cave you should know that a tower defense game has you building all sorts of towers to defend against some invading force that wants to either get from one side of the map to another or get to something that you have a finite supply of and take it away from you. If a certain number of these things get across the map or take all of your things then the game is over. Hex Defense is no different here. Think Geometric Shapes and bright colors and you'll get a feel for the maps in the game. The enemies are shapes such as squares or circles that navigate through the map to try and get to your home tile and steal one of your precious 10 lives. There are twenty waves of enemies on each map, each progressively harder and twenty maps in the paid version with which to challenge you. Couple that with two different difficulty levels and you'll have quite a job on your hands for the current price of US $1.49. Gameplay is very straight forward. On the bottom of the screen are your four tower types. Place your finger on a tower and drag it to the location on the map where you'd like to place it. The game will tell you if it is a valid location (you can't block the invaders completely) and then lift your finger. The tower will place and begin shooting at the invaders as they go by. 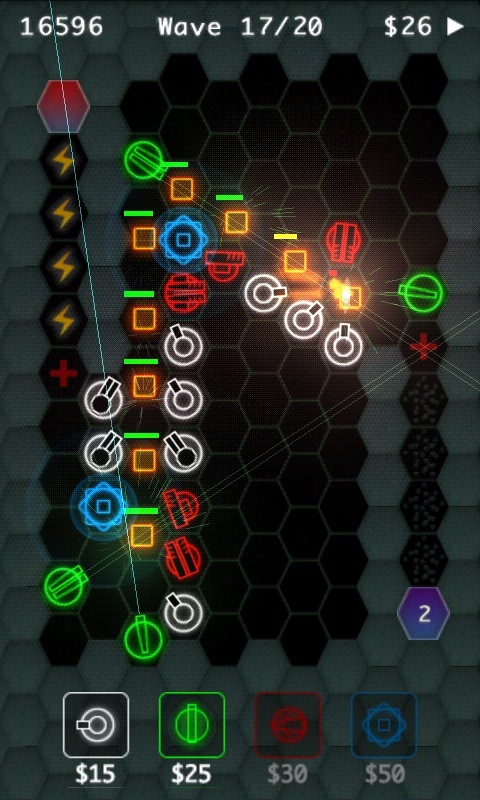 Each tower has different abilities such as lasers or missiles. The really fun part is that each tower can be upgraded up to four times to make it more powerful. Each successive upgrade costs more money, the only way to make money is to take out those invaders. The game becomes strategic as you try and decide the best mix of towers and placement based on the amount of money you have. As each wave comes the invaders become more and more powerful and work their way towards your home tile faster. Your job is to create a maze of towers and upgrade them as fast as possible in order to defeat all twenty waves. Each map is unique and some of them even contain special tiles. These special tiles can either help or hinder you. For example, one tile gives the invaders back health as they go over it so avoid these at all costs. Another tile slows down the invaders so if you can funnel them into these with your tower placement you can gain an advantage. One of my favorite maps is called "PotHoles", in this level, there are two locations that funnel aliens into them, one gives health to them, the other takes it away. It's fun to create a maze of towers around and into the various obstacles. Twenty Maps might not seem like a lot but if you take into consideration the two difficulty levels and the time it takes to really master each map then this is a good value for your money. If you read some of the reviews on the marketplace people seem to think it is too easy but I disagree. The first level that I beat was the 11th map, one called Two Paths, the map has a central bottleneck so I just loaded up my towers there and upgraded them and for the first time was able to beat back the onslaught. This felt like a real accomplishment. I hope that the game designers continue supporting this game in the form of more maps and perhaps online leaderboards. The scores are only local but it is fun to see if you can beat your previous score. I think that there should be separate scoreboards for normal and hard difficulties, as it stands there is no way to differentiate the two so if you score lower on the harder difficulty it just says your high score is what you scored on normal. My only other gripe is that I have to turn down the graphics in order to get smooth gameplay on my HTC Incredible. It runs ok with the full graphics on but if things get hectic it slows down quite a bit. I'm glad the developers put the ability to switch down the graphics detail in there. So that's it, Hex Defense is an entertaining pick up and play game that will take you some time to master. It has depth and playability that make this one that everyone should check out. If you're unsure, go check out the free version that is out there but I think you'll agree that the developers deserve paid support on this one. I give it 4.0 out of 5 stars! I recently got an iPad 2. Yes, I know... I'm a traitor to the cause, but in my defense there's a lot of great stuff available for iDevices (board game conversions in particular) coupled with my desire to move into mobile development soon such that the pros outweighed the cons. Plus, I still have an Android tablet on order which will be my primary usage device. Anyhow, two of the things that have really stuck out about having a tablet are a) how much my five year old has been attracted to it for games, books, music... etc (and so has the two year old) and b) how much fun it is to lay it flat on a table and play games with it against other players. 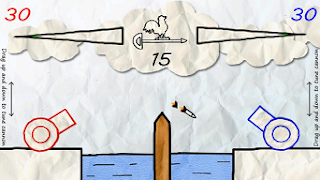 Paper War for 2 Players, as you'll read, is a game that would be great for a tablet. The concept is simple. Using 'doodle' style artwork, Paper Wars for 2 Players features 3 simple mini-games that require two players. It might be nice to have had a computer player as an option, but the title says it all. The three games are Shoot Mode, Canon Mode, and Tap Mode. In shoot mode you and your opponent man guns on the opposite sides of a chasm and planes float and whiz by. You have to shoot down planes of your opponent's color and the first one to 30 points wins. There are three kinds of planes... slow ones worth a point, medium ones for two, and fast ones for three points. There are also bonus objects that either player can shoot. Control is done by holding and dragging to aim your gun and removing your finger from the touch screen to shoot. Canon mode has you shooting at your opponent's canon and adds a power gauge that just cycles from low to high and then back to low to repeat the cycle. Tap Mode removes guns altogether and has you simply tapping on enemy planes to destroy them. 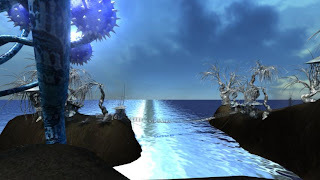 The doodle style graphics are done well for doodle style graphics and the games all play smoothly. Tap Mode was very difficult to play on the small screen of a phone especially as there's no concept of sides. Imagine trying to coordinate sharing an app with another person and you get the idea of how well that works. The other two games played ok on a small, phone sized screen, but all three would really benefit from a larger table style device making me all that much more excited about getting an Android tablet soon. I really like these kinds of games as they make great time killers while waiting for food at a restaurant. I'm also seeing more and more board gaming done on tablets and while it's still a tiny fraction of people I see gaming at conventions it is a medium with much potential. I think we're all seeing that the best tablet games aren't the ones that try and pretend it has a joystick by using a virtual game pad, but rather those that take advantage of the device's strengths and avoid its weaknesses. This set of mini-games is all about tablets and touch screens. 4/5 stars. Space Out puts a new spin on the break out / break the blocks type of game - instead of a bat you tilt your phone to control where the ball goes. Try to keep the ball inside the level boundaries and break all of the bricks to proceed to the next level. Level boundaries aren't boring rectangles and the gaps don't stay still. A series of power ups are available to help you along the way, which (amongst other things) will blow up blocks, teleport you to safety and even freeze time. Zygo Games are a small indie developer from Nottingham England founded in 2011. Space Out is our first foray into game development exclusively for the Android platform. We wanted to make a game ideally suited to the mobile platform - easy to pick up for short bursts of play with intuitive controls using the accelerometer and touch screen. We hope you like the result! 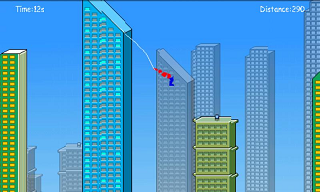 I'm not sure exactly what genre of game they fall under, but I enjoy games in which the goal is to swing from rope to rope through a city landscape like Spiderman. I've tried two such games on Android and will contrast them and pick a winner. Rope To Fly and SpiderBoy both have an identical premise. Using rag doll style physics (in that your body bends and breaks) you'll cast ropes at buildings and swing between them to navigate through the city. 'Navigate' might be a strong word here given that you're always headed east, but you get the picture. This style of game pretty clearly falls under 'arcade' style and if it was just swinging on ropes all day things might get boring mighty quickly, but each game offers several modes of play. Rope To Fly offers five different modes of play: Infinite Mode, 100 Meter Mode, 30 Second Mode, Ten Ropes Mode, and One Rope Mode. Each of the mode's differences should be somewhat apparent from the name of the mode. When distance is the key then time is the score and when time or the number of ropes you possess are key then distance is the score. SpiderBoy offers far more in terms of options with 10/30/60 second modes (and not just a single 30 second mode), 1/3/10 ropes mode, and 1,000/3,000/10,000 meter modes along with three difficulty levels of free play, day and night modes, and even one prebuilt city (in addition to random ones). Graphically neither game is a powerhouse, but Rope to Fly is slightly prettier. It even lets you customize the colors of your character although I don't personally get into doing that. I also find its backgrounds to be a bit more colorful. Both games do a good job of splitting my character into many bits and pieces upon contact with the pavement below. Rope To Fly also adds comic style bubble messages that appear when making a good move. From an audio standpoint Spiderboy has a little more sound effects although they tend to be basic. Control wise, both games are the same and I didn't experience any real issues when jumping from building to building. Both games played reasonably smoothly as well. 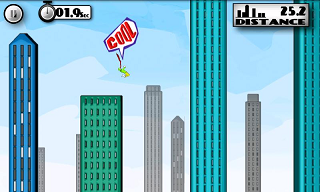 Sometimes more can be less as the idea of difficulty levels in SpiderBoy appealed greatly. I really prefer to play this style of game in infinite mode and one rope mode just seems pointless to me (one good swing and you're done?). However, on maximum difficulty I found the buildings to be too sparsely laid out so yes, not only was it difficult it was damned near impossible! After playing both my personal favorite is Rope To Fly despite the lack of options, but it's a close race and neither game is really superior to the other. They're also both free so there's no barrier preventing you from pulling them both down and seeing which one you prefer. 3.5/5 stars... for each of them. Hey! That's My Fish is among few simple yet elegant board games that is easy to learn, but hard to master as cliché as that may be. When I saw that it has arrived in the Android Market I was quite excited. At $4.99 it's kind of pricey, but I can't blame them for charging top dollar for a quality title and this is very well done. For those not familiar with this game it is quite simple. There are 60 hexagonal ice flows that contain 1, 2, or 3 fish. 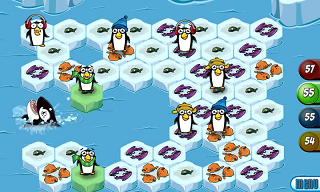 The game support 2, 3 or 4 players and you control 4, 3 or 2 penguins respectively. You then, in turn order, place all of your penguins on ice flows that contain one penguin. Once all penguins have been placed the game starts and you can move your penguins in any of of the six possible directions gobbling up all of the fish on the ice flow you just left (and gobbling up fish is how you score points) and removing said ice flow from the board leaving a hole in its place. The only movement restrictions are that you cannot move through any penguins (even your own) and you cannot cross any of the holes left by removed ice flows. Like I said, a very simply game with some solid strategy behind it. You can play the game with human or computer opponents and I'd say having this game is a perfectly valid substitute for owning the board game (whereas in many cases there are differences between the computer version and board game version). The computer AI comes in three difficulty levels. I cranked up the AI to the highest level and played a couple games. I consider myself to be quite a good HTMF player and I was able to win both four player games with minimal effort. The computer played a respectable game, but wasn't anywhere near as good as some of the seasoned players that beat me online and offline. I then tried a two player game and the whopping I gave the computer was substantial. Don't buy this if you think you're a solid player looking for a challenge. The graphics and animation are excellent for a board game as are the sound effects. Movement is done by touching the penguin you want to move and then touching the ice flow you want to move to. The game also highlights all available choices to make things easier... as if that were necessary. I didn't have any control issues on my phone, but if playing with other people I think a tablet would make this game much more fun to play with. The game also adds alternate set ups instead of the usual, interleaved rows of 8 and 7 ice flows. Two production oddities to me are that this computer version was produced by Fantasy Flight Games whereas the board game comes from Mayfair games. Second, the board game has an exclamation point after the 'Hey!' in the title whereas the computer version replaces that with a comma. Why? Apparently Fantasy Flight now has the publishing rights and replacing the exclamation point with a comma was important to them. Hey, That's My Fish! is a great game and this is a solid computer port. It would be nice to have better AI, but the AI here is enough to get you started. This game is also simple enough to be played by youngsters while being challenging enough for adults. Whenever I've introduced the game to friends they've all walked away impressed. 4.5/5 stars. Edit: We welcome Bill Schoonmaker to the MeAndMyDroid review crew. Having another extra hand for reviewing will allow for the reviews to come that much faster. Thanks, Bill, for joining us! 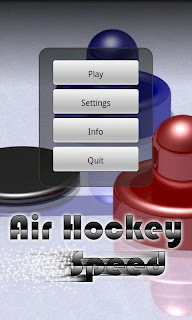 Air Hockey Speed endeavors to be a fast paced reproduction of the age old arcade classic Air Hockey. For those of you not old enough, Air Hockey was the game back in the corner of the old arcades we used to frequent. It was a table with a bunch of tiny holes in the surface. Once you put your money in air would come out of the holes. Each player then held a round paddle and hit a puck back and forth that floated on the cushion of air. It was fast paced and frantic! Most of the time, from outside the arcade, you could hear the clack clack of the puck hitting the paddles as two geeks battled it out over a first to score 7 round. Over time, the game, like most arcades went the way of the dinosaur but you can now play this classic directly on your android phone by downloading it from the Android Market. The game has a fairly small footprint and can also be moved to your SD Card if you so desire. The size of the install is only around 1.8 megabytes. The version that I reviewed was 1.08 and included a few fixes and enhancements that you might enjoy. When you run the game you are presented with a nice interface with no background music. While I normally don't play games with the sound up very loud I noticed immediately the lack of music. I then exited the game and fired up the Android music player and played, what else, some Van Halen as a salute to those golden years of arcading. I then re-ran the game and lo and behold, background music! From the main menu you have the option to Play, Change Settings, get some information or Quit. I should also mention that this is the Free version and towards the bottom are advertisements. They are not at all intrusive at this point. Going into the settings menu gives you several options. You can turn the sound effects on and off, turn vibration on and off and even enable or disable the puck trail. For single player games you can also change the Best Of... which means you can change the number of goals it takes to proceed to the next level. The default is best of 9, but you can also change this to 11, 13, 15 and even 17 for those long games. Back to the main menu and a quick press into the information screen gives you the only help available in the game and also a link to the developer's home page, HyperKani.com Heading back to the main menu and a press of the play button gets us one step closer to an actual game of Air Hockey. Here you can choose one player or two players. 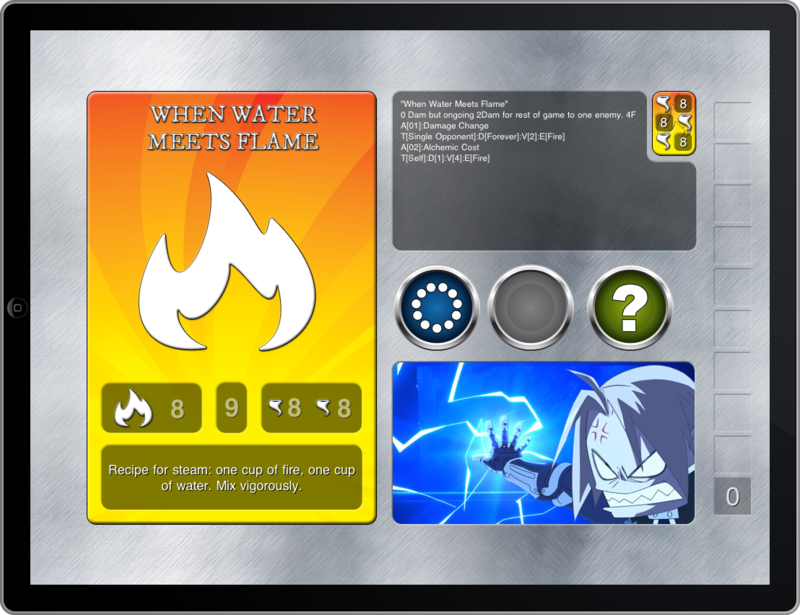 Pressing the one player game presents you with an additional menu where you can choose the level to start off. Scrolling through this list shows you that there are 30 levels of AI to beat. At a best of 9 and 30 opponents that means it would take me 150 goals to best this game, quite a bit of entertainment for a free title. Choosing level one gave a slight pause as the game appeared to freeze but moments later I was presented with the game and the puck sliding left to right as if ready for a smack. The computer was on the top of the screen with the blue paddle and myself on the bottom with the red paddle. Placing your finger on the paddle gives you control of it. You can slide it back and forth, up and down, anywhere on the bottom half, or your side of the playing field. Think tennis if you're having a hard time grasping it. On the top is the opponent's goal. You have to slam the puck using your paddle to get it past the computer opponent and into his goal. Doing so will result in a score and getting five of these will allow you to proceed to the next level, if your opponent gets 5 then you lose the round. I'll admit that level one was a breeze, you could almost stand in one spot and just let the computer score on itself. He'd usually get the puck behind his paddle and then either hit it in himself or it would bank in easily. After a win you are presented with a nice silver trophy cup and then the only nag screen that I could find in the free version. There is a timer at the bottom of the screen where you have to wait a few seconds before skip is enabled. Pressing go will take you the advertisement showing on the screen's web site. It really is not that much of an annoyance at all and for a free game one of the least intrusive that I've seen as the ads aren't even on the main game play screen at all, just on the main menu and win/lose screens. Speaking of which, losing a game shows you a funny looking sad face with a busted tooth and a black eye. I did try clicking on one of the ads in the game, the Go button in the win/lose screen and strangely enough I got a message that stated [Sorry, Failed to Load Ad]. Maybe the Author needs to check into this as their revenue stream may be cut off. As far as game play is concerned the game is very smooth on my HTC Droid Incredible. The colors are vibrant, the controls are good save for the occasional jerk but overall the game is very playable. As I stated earlier the game starts off extremely easy but ramps up quickly. I honestly was only able to make it to level 6 before I lost a match. Fighting through several more levels has me currently at level 10 and not able to beat the computer. Essentially if you leave an opening here he will get a goal. The best defense is after a hit is always remember to move your paddle back down towards your goal to leave the least amount of opening available. If the game is this difficult on level 10 I can't imagine getting to level 30! In terms of replay I can't see a reason to do it again once you hit 30 but it will take some time to get there. There are no achievements or any other trophies to speak of other than the one you see after winning a round but it is the same every level at least up to level 10 as I've seen. Perhaps the author could add achievements for things such as a shut out or a straight in goal. Add Open Feint support and things could become a lot more entertaining and attention holding. There is a two player game mode where you could lay your device on a table and each person would control a paddle. I tried this by myself and it seems to work fine, might be good for a diversion or two while waiting for food in your local bar. Overall for a free ad-supported game this thing is a lot of fun. There is also an ad-free version you can get for around $1.00 US but I honestly can't see a reason to buy it because the ads are so unobtrusive. There really is no reason not to grab this one if you are a fan of fast paced pick up and play games. This might not be something you'll play for hours on end but it'll entertain you until you get frustrated that the AI is too good. Overall I'd give it a 3.5 out of 5. Thank you for reading! Amazon.com is fighting hard to gain a foothold with respect to selling software to Android owners. It's been a bit of a surprise to me that they still haven't established themselves on an international level, but they are working hard to have some quality games that aren't available on Google's Android Market. Hero Princess is one such quality game. It reminds me of an old, old game I had on my Atari 400 from Thorn EMI called Orc Attack. In Hero Princess you are the 'hero princess'. You're a 'princess' by birth, and a 'hero' because the sole defense of the castle from the invading Vikings is up to you. The Vikings have already deployed their ladders (and why she doesn't just kick them away is... never mind) and are furiously climbing up to capture you and take the castle. But you have an unlimited supply of pebbles at your disposal to drop on them and so you do... tap tap tap on each ladder to unleash a hell storm of pebbles to knock those Vikings down. The game would get old if it was just that, but there's more... you can also shake the ladders. Oh, and did I mention power-ups? There are four basic types of Vikings that you will be fighting... one that can be disposed of with a single pebble, another that has a shield and requires multiple hits to be eliminated, a third that needs to be shaken off, and then the Viking ghost that is eliminated with a combination of the two attacks. Naturally, as the game progresses there are more and more Vikings that are sent to capture you and they always win in the end. The graphics are sharp and pretty with nice detail on the Vikings and the sound effects are rock solid. The touch screen interface is also really nice especially when compared to an old Atari joystick. Just tap a ladder and your princess instantly appears with weapon in hand. There have been many variations of this type of game and my memory credits Tapper with being the first of its kind. I'd even say a game like Flight Control owes something to this genre. However, I love the whole fantasy theme with castles and Vikings and ghosts over serving beers in a bar so this game gets extra style points from me. Hero Princess, at $0.99, is an excellent addition to anyone's Android game library. It's fast, plays smoothly, makes good use of a touch screen interface, and has that extra 'cuteness' factor all in favor of it. If you're looking for depth... look elsewhere, but if you're looking for challenging arcade games that are of high quality then this is a dollar well spent. 4.5/5 stars. Dark Nova is apparently an adaptation of an old Palm OS game, Space Trader. I owned a couple Palm devices back in the day but never played Space Trader. The game looked interesting, though, and contained the magic "RPG" words in its description, so I was willing to give it a try. I figured that any game that people wanted to bring back from obscurity like that had to have something going for it. 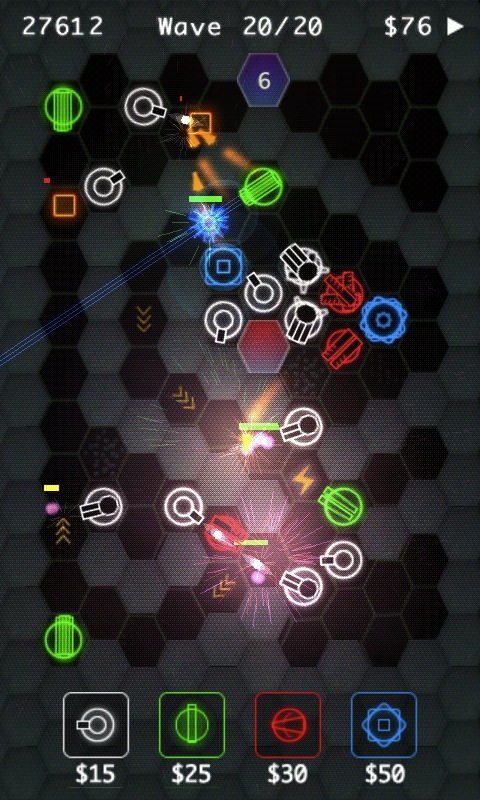 Dark Nova is a sci-fi RPG, where you control a single adventurer piloting a single ship. You assign skill points to your character across four different skills and then are let loose into the galaxy. 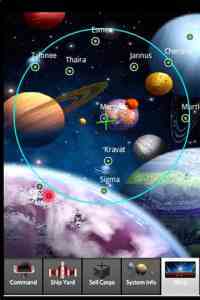 The help does a decent job of explaining the basics and controls, but is somewhat light on the nuances of the game (using the galaxy map to find planets, for instance). At any rate, your first flight will quickly be under way. There are two main approaches to success in the game: trading and piracy. You'll need to engage in legitimate trade for a while to build up a powerful enough ship to become a pirate. There are a bunch of commodities available, and the game has a decent interface for looking at what the prices are in the neighboring systems. Along the way, you'll encounter a variety of ships, from pirates to fellow traders to police. Upon reaching your destination, you can sell your cargo, perform repairs, upgrade your ship, read the newspaper and occasionally have a special quest to deal with. Combat is pretty straightforward in the game. Whenever you encounter a hostile ship (or make another ship hostile), you will have a choice between attacking, fleeing or surrendering. No matter what you choose, you'll simply be presented with the results of that round of combat and then are presented with the same choices again, if appropriate. One thing that the help should have made clear is that the damage on the ships is represented by the amount of red showing on them. It took me a while to notice that, and it made it difficult to make the fight/flee decision. Combat can take many rounds to complete, and there's an unfortunate decision made with the interface to use a toast (popup message) to convey the results of combat. Either you have to wait for each message to resolve, rendering combat slower than it needs to be, or they stack up and you can't necessarily tell what is going on. The goal of the game is to make enough money to buy your own moon and retire. That can take quite a while, and it's a little bit of a grind getting to that point. Once your character is established, there's not a ton of risk involved in running trade routes, as you'll be able to easily escape from anything you can't handle, because your shields can deflect plenty of damage. The piracy route does involve more danger, but it's again fairly easy to get established and have a pretty straightforward run toward the end. I will note that I haven't yet played on the more difficult levels of the game, so it's certainly conceivable that the difficulty is higher. Most of the danger in the game comes at the beginning, when you have a poor ship and you can get destroyed by enemy ships even if you flee from them all at first sighting. I enjoyed Dark Nova a fair bit, although after completing it, I haven't been back yet. I suspect it'll be the kind of game that runs hot and cold with me. In some ways, it feels a little like a roguelike game set in space, where you start out vulnerable and have to build up a viable character, and then carry through your execution until the end. I appreciate that there is a fixed endpoint in the game, and the actions of planning out routes was entertaining. I do feel like the combat and travel is too repetitive, and I found myself wishing there were more of the special events and quests to liven things up. Some more variety in the game would have been welcome. The game does fire up quickly and it's very easy to play in small segments, which is very useful. I'd give the game 3.5 stars, recommended for folks who are looking for an adventure game that can be played in bite sized pieces or are looking for a trading game. The game is on sale right now for $1.99, so it's a good time to buy. The big guys are gobbling up successful, mobile game developers for better or for worse. Firemint is the company behind the insanely successful and often copied Flight Control despite it being published by Namco on the Android Market (don't know if this changes that relationship?). They've also developed one of the hot racing games on the iOS platform. Remember: EA is the company that said they were going to support Android gaming last September and what have we seen? Football season has come and gone without Madden for Android and they've released little else. In this aquatic adventure, you start off as a tiny egg in a cramped jar, and escape into the open sea. Devour your way through 64 levels and 7 stunning environments to reach the top of the food chain. 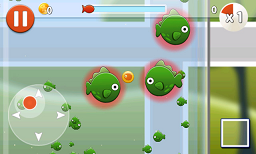 You’ll encounter dangerous fishes and helpful power-ups to aid you through your journey. Collect coins to upgrade power-ups in the shop, then test your skills in survival mode, where endless hours of replay and online leader board awaits. Epic Pixel was newly founded in 2011. This small indie game studio is made up of two brothers who have left their cushy day jobs at fortune 500 companies to pursue their childhood dreams of making games. The mission at Epic Pixel is simple, make great games and share it with the world.